Listen to a song with specific directions such as Old MacDonald, If you’re Happy and You Know it, or The Silly Dance Contest by Jim Gill. 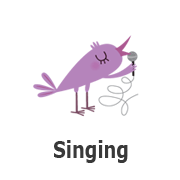 These songs with specific directions strengthen speech and language development, listening and comprehension skills. Put on your favorite song or songs. Work on jumping skills. Jump high and low, like a frog, like a kangaroo, and learn how to bounce. There are so many ways to practice this gross motor skill while listening to your favorite music. Participate in one of our amazing programs at The West Bloomfield Township Public Library. We have programs for children of all ages that involved singing, dancing, finger plays, reading, and fun. These programs are interactive, creative and always a good time. Pick up a current program brochure for more details.